So between llamas and a technicolor dress, the internet kind of exploded on Feb 26. In the middle the dress as the picture was originally taken. On the left it’s been shopped to be white/gold and on the right it’s been shopped the other way. 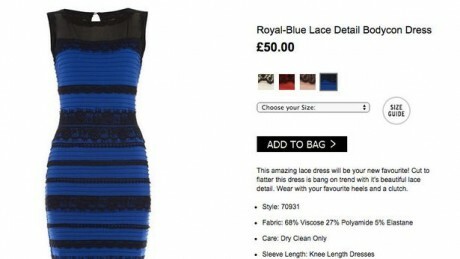 The dress in question is a lovely shade of … white and gold or blue and black. Or there was a popular third option. Who cares? Neil deGrass Tyson had a perfect tweet about the whole dress thing. If we were honest about shortcomings of human physiology then "optical illusions” would instead be labeled “brain failures”. There have been a lot of takes on the dress from “what the hell is happening? Science! ?” to “Haha jk lolz what color is this dress?”. I want to take this unique chance to talk about the power of optical illusions, bias, and how the world looks to things that aren’t us. The following examples do not take into account how good your color vision is, which you can test here. So lets start with the thing that started it all. There are plenty of places to search around the internets for what happened. But basically, the camera did a bad job at detecting white balance. This is important so colors look in a picture how they do in real life. If the white balance is off pictures can look too yellow or too blue. Or, in the case of this particular dress image, it’s caught exactly at a threshold between. Why white balance is important. 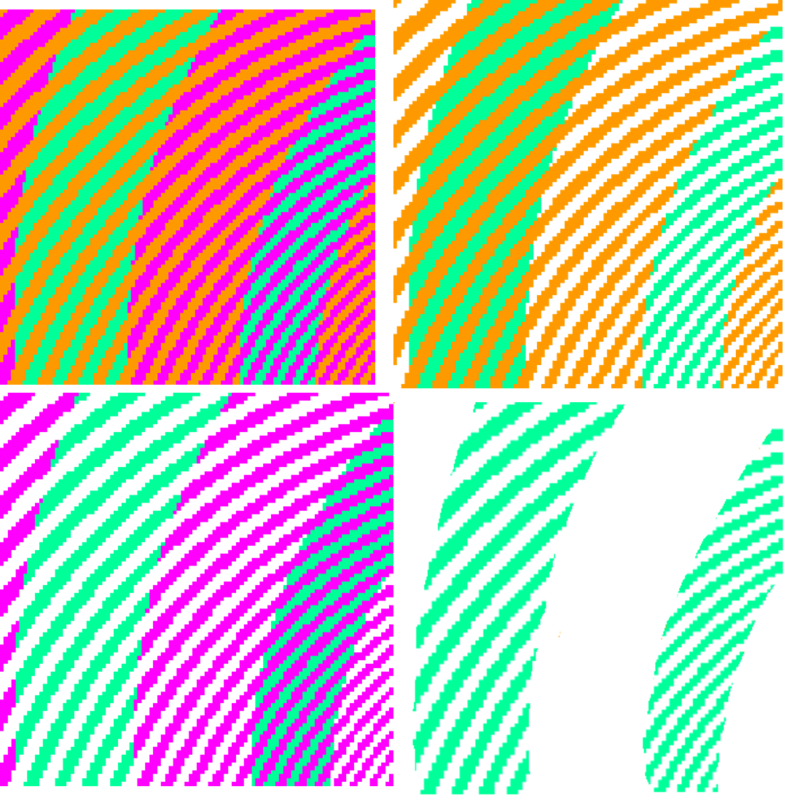 The middle picture is the correct colors. The other two I offset the white balance on my phone. The only reason it’s important is because if you think the background is natural light, your brain subtracts “blue” light and you see white and gold. If you brain thinks you’re in artificial light, it subtracts out the yellow and you see blue and black. this is a product of color constancy – where your brain interprets color and adjusts for the lighting. 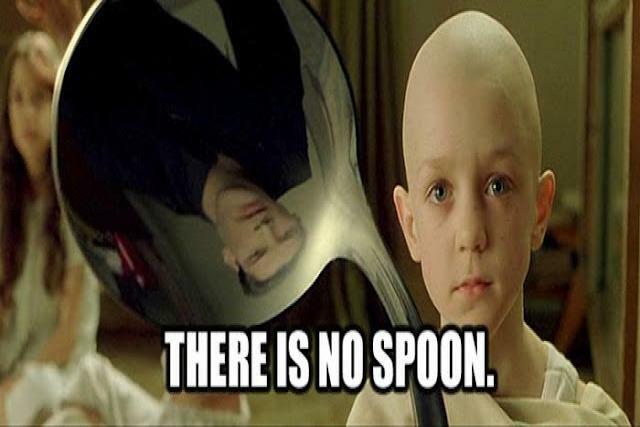 It helps keep the world from being confusing all the time. This dress picture is amazing because it’s directly at a threshold that shows how fallible the human brain is. Have you had friends tell you that their eyes change color every day? I have about five of these. 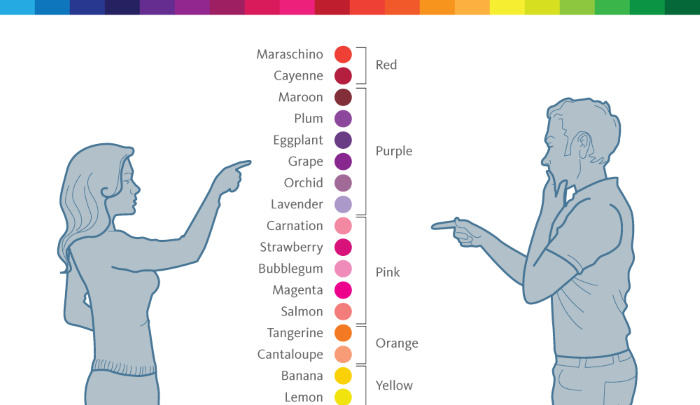 That’s because how we perceive color is directly related to what other colors it’s next too. So your friends eyes appear different colors depending on the makeup they’re wearing or the shirt that they’re wearing. In addition to the lighting. What if I told you the green and the blue are actually the same color? You can click on the picture to see my deconstruction. Even something as simple as a light or dark background can make iridescence easier or harder to see. A whole world is hidden in previously thought to be boring insect wings. Clear wings can hold a hidden rainbow that can only be viewed against a dark background. I briefly mentioned this in my previous post about compound eyes. The number of words in your vocabulary affects the number of colors your brain can differentiate and not the number of colors your eyes can actually see. People in Russia, who naturally have different words for “light blues” and “dark blues”, can differentiate more blues than people who natively speak English as their first language. Similarly, kids from an African tribe lump red, pink, and orange together because they only have one word for those colors – “serandu”. When showed all the cards at once, they could say that they were different, but interpreted them as the same colors when shown them separately. Similarly, we could probably tell “sky blue” from “cyan” but when asked about it an hour from now you’d probably just say “light blue“. In fact, this article, has a test t see how well you can distinguish green using this same principle. Okay Fine. But what Color is the Dress? 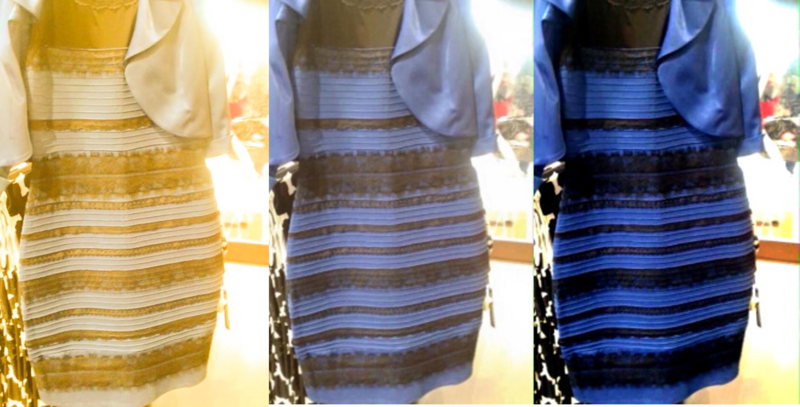 The picture of the dress of arguable quality sparked the question, “what is the *REAL” color of the dress? Technically, when you take it out of bad lighting – it’s blue and black. But here’s the question. It technically reflects blue and black light. But what about things that reflect wavelengths we can’t see? Here’s a great Minute Physics video about how the color pink is technically not “real”. Basically our brains fill in information for the parts of the spectrum we can’t see. Pink is just light minus the green. What is “Visible Light?” and to Whom? We can’t see UV light but many insects can. This drastically changes how insects view the world around them. The color of this butterfly, the Giant Swallowtail really depends on what types of wavelengths your eyes can detect. Butterflies are team yellow. If you want to see stunning effects of UV fluorescence in insects, check out Nicky Bay’s UV gifs. The same Giant Swallowtail butterfly under white light and UV light. Being sensitive to UV light also help insects feed themselves. Flowers utilize UV patterns to guide pollinators to their nectar stores. 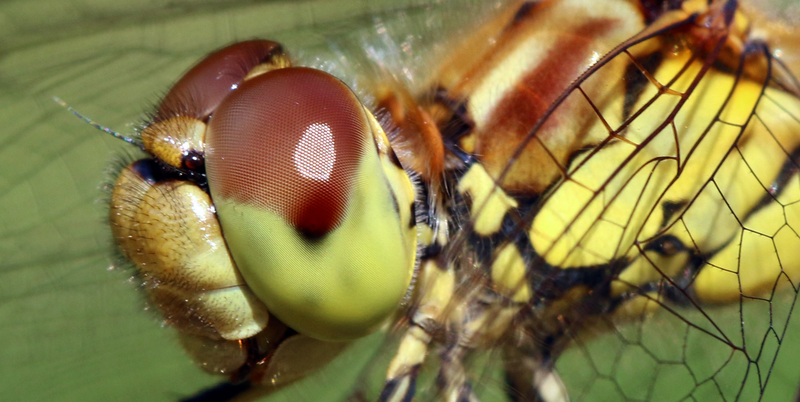 Some predatory insects, including dragonflies and owlflies, have dark colored violet/UV sensitive parts of the top of their eyes which help them see small prey items flying quickly against a “blue” sky or a cloudy sky. In fact, the sky is really only blue to humans because we are particularly bad at seeing violet light. I see the sky in it’s full violet and ultraviolet splendor. Many insects can also see polarized light, which is important in mate recognition and navigation, and helps insects detect water … and accidentally dark colored cars. Polarized photography can help us understand how the butterflies appear to each other and other insects. A Heliconius cydno photographed in both visible light (left) and through polarization filters (right). This butterfly has polarized (blue) regions and unpolarized (black) regions. It goes the other way too. Insects can’t see red or orange light well. If fact, many experiments are conducted with cockroaches under red light. The cockroaches don’t perceive the red light and act naturally in their seemingly “dark” environment and the experimenters can evaluate their behavior. Many deep sea fish are red and some squid and octopuses will change from transparent to red when bio-luminescent predators illuminate them. Why? Well this is because red wavelengths can’t penetrate very far below the water’s surface. So at a certain depth everything that is red just looks murky, blueish, gray like the ocean background. I also mentioned this in my post about compound eyes. 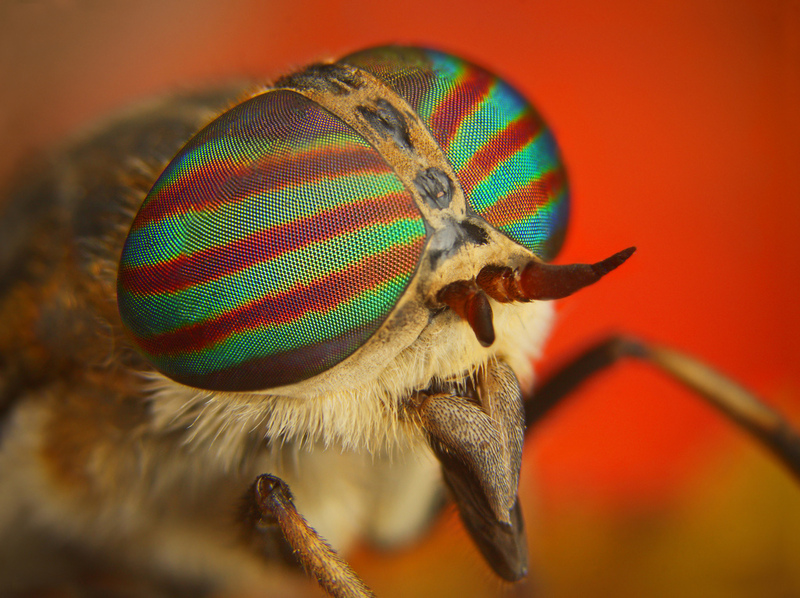 Many flies have crazy color patterns on their eyes. While it can be used for mating, it’s thought that especially for blood feeders like horse flies, that the green specifically grays out vegetation. This is so the horse fly can more easily find its host among the muck of green information. So what’s green to us, might really be grey to a horse fly. This dress to me was more than just a frivolous quirk of the internet. For a moment “reality” was breached by a trick of the light and people couldn’t fathom that people saw this combination of fabric in colors quite the opposite of “white and gold” or “blue and black.” As Hank explained in the video above, the real color of the dress is blue, but to the people who see the dress as white and gold, their experience was also very much real. Just as even though in the swirly image, the blue and green are technically the same color but our altered version the colors are very much “blue and green.” The sky is really violet, but our reality as humans is that it’s blue. This is of course, if you can see color. I would argue that color blind people have a “real” experience even if they can’t differentiate between colors like I can. And to a blind person, color isn’t even a thing that is “real” or makes sense. The dress is just a perfect reminder that our eyes receive data and our brain translates it, sometimes very poorly and that what we may consider “obvious” or “real” is just a matter of perception. Another video about the dress. Belušič G, Pirih P, Stavenga DG. 2013. Acute and highly contrast-sensitive superposition eye – the diurnal owlfly Libelloides macaronius. The Journal of Experimental Biology 216: 2081-2088. Kriska G, Csabai Z, Boda P, Horváth G. 2006. Why do red and dark-colored cars lure aquatic insects? The attraction of water insects to car paintwork explained by reflection-polarization signals. Proceedings of the Royal Society – Biological Society 273(1594): 1667-1671. Sauseng M, Pabst MA, Kral K. 2003. The dragonfly Libellula quadrimaculata (Odnata: Libellulidae) makes optimal use of the dorsal fovea of the compound eyes during perching. European Journal of Entomology 100: 475-479. Shevtosva E, Hansson C, Janzen D, Kjærandsend J. 2010. 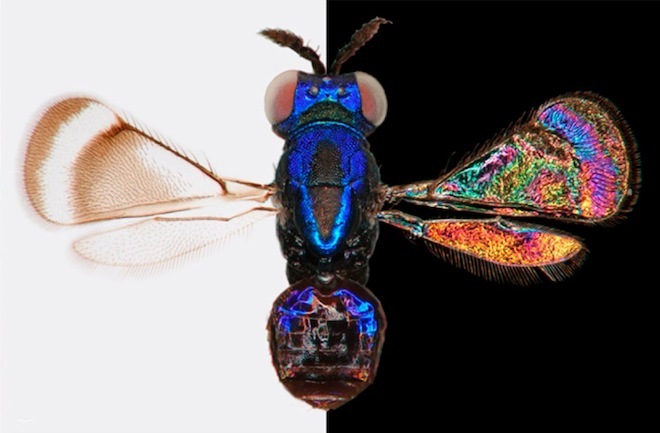 Stable structure color patterns displayed on transparent insect wings. PNAS 108(2): 668-673. Sweeny A, Jiggins C, Johnsen S. 2003. 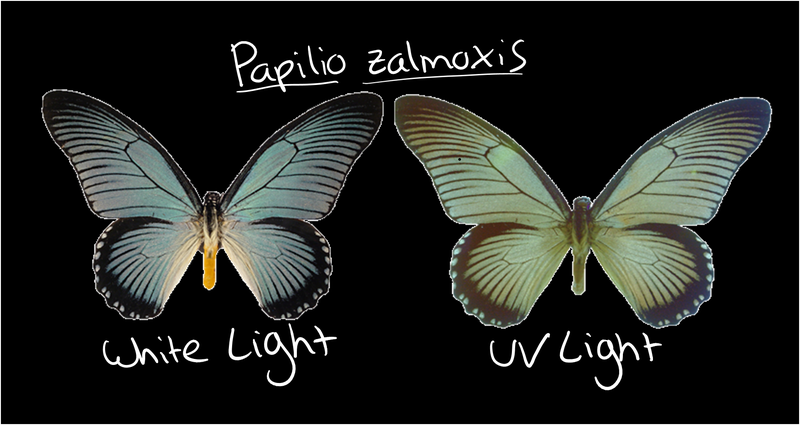 Polarized light as a butterfly mating signal. Nature 423: 31-32. This entry was posted in Culture, Ecology and tagged Dress, DressGate2015, Insects, Optical Illusions, Polarized Light, UV Light. Bookmark the permalink.